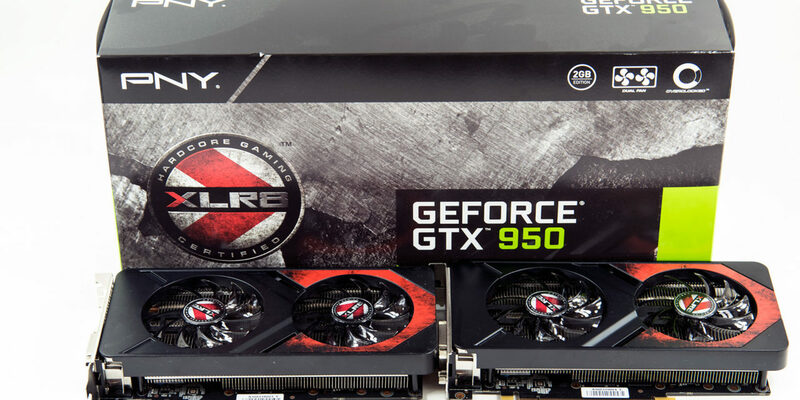 Recently we took a long hard look at the recently released PNY GeForce GTX 960 XLR8 OC Gaming 2GB video card and walked away impressed with not only the value this card offered, but the very fact that PNY were willing to release a new GeForce GTX 960 model on the virtual eve of the GeForce GTX 1060’s release. On the surface that sounded ludicrous but two of those cards in SLI proved to simply be too good a value to pass up! 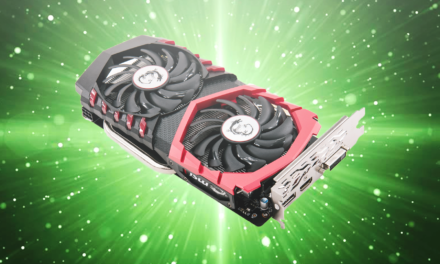 Today we are going to take a look at its little brother, the $160 PNY GeForce GTX 950 XLR8 OC Gaming 2GB to see if it is as good an option as its big brother was. As the name suggests the PNY GeForce GTX 950 XLR8 OC Gaming 2GB is a GeForce GTX 950 2GB factory overclocked model that sports a custom heatsink and fan design. 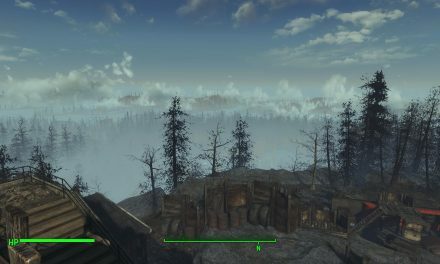 To be specific it uses a slightly modified version of what the GeForce GTX 960 OC Gaming comes equipped with. 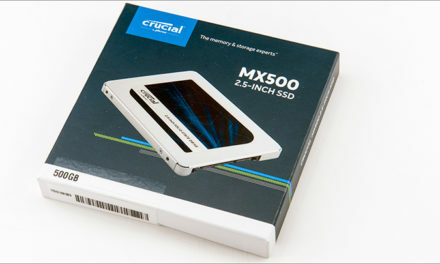 That is to say the newest version of PNY’s heatsink design that has powered numerous award winning models to greatness. Put another way this new design quickly impressed us as it is not only more effective at keeping the core cool, but can do so at even lower noise levels – so much that at idle the fans stop. However, with their built in LEDs these fans are awfully pretty when running and never really got above a whisper… and yet kept a heavily overclocked GeForce GTX 960 cool and happily chugging along at its boost speed. As the factory overclock that PNY has bestowed upon their latest GeForce GTX 950 creation the OC Gaming XGB comes with a stock speed of 1152Mhz and a boost speed of a very impressive 1342Mhz. 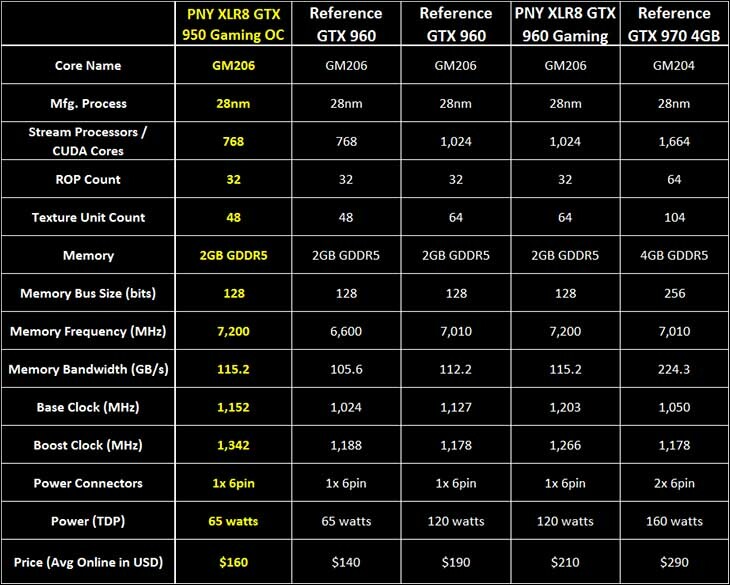 Compare and contrast this with a NIVIDIA ‘reference’ GeForce GTX 950 that has a stock speed of 1024Mhz and a piddly maximum boost speed of 1188MHz and you can see that PNY are serious about pushing the (cut down) GM206 to its limits! Equally impressive is that PNY has once again factory overclocked the memory from an effective speed of 6,600Mhz to 7,200MHz. This last overclock is actually the most important. 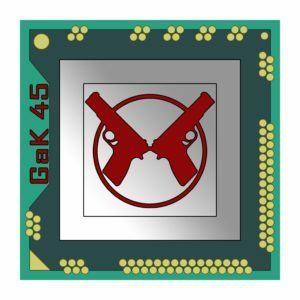 As we all know the small 128-bit bus that all GeForce GTX 950’s (and 960’s for the matter) come with is a major bottleneck; so anything that can boost the bandwidth is a good thing. In this case the memory bandwidth has been boost at the factory from 105.6GB/s to 115GB/s and this should provide a much needed real world improvement in performance! As PNY so graciously sent is two for review we will not only see what one of these cards can do, but what they can do in SLI. 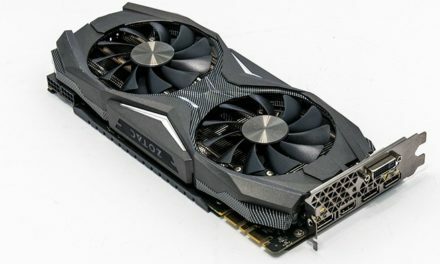 With this in mind we will be highly interested to see if picking up two of these instead of spending twenty dollars less for a used GeForce GTX 970.